A remarkable set that combines an original 1840 Penny Black Stamp and a pure gold coin. Commemorating the 175th anniversary of the World's first postage stamp in 2015. In 1840 an innovative new idea was launched that was destined to transform the way we communicate with each other - the postage stamp. In 2015 the world's first postage stamp - The Penny Black celebrated its 175th anniversary. The Penny Black is a symbol of the wonderful era of innovation during the 19th century. It may surprise you to know that, despite its world fame, the Penny Black was only ever issued for a little over a year. An original 1840 Penny Black stamp and a pure gold coin brought together in an exclusive limited edition set. The Penny Black Anniversary Stamp and Gold Coin Set includes an original 1840 issue of this famous stamp together with a 1/4 oz pure gold coin. 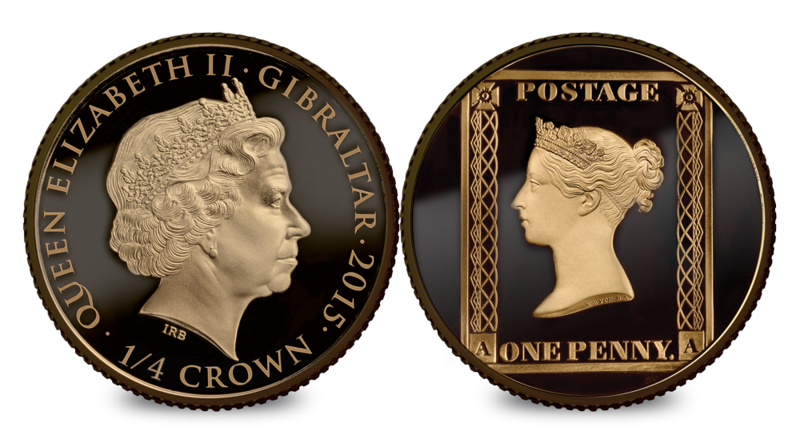 The coin is remarkable because it struck in pure 24 carat gold, and layered with black ruthenium gold to achieve the appearance of the Penny Black stamp. The design features a rendition of the Penny Black stamp from ‘Plate 11’ which is the rarest type of the1840 Penny Black stamp. The set is housed in a superb, display case complete with Certificate of Authenticity.